The Rise of Iron Breathes New Life Into Destiny — GamingWithSwag.com - Dads By Day, Gamers By Night. The Rise of Iron was released and Chris and I had both preordered it so we could jump right into the action. First thing I did was run to the Tower to see what goodies I was being granted (Pre-Order Bonuses) and I was surprised to see that I have an item to instantly level a character up to level 40 which is the maximum. I think about the hours it would take to unlock all their abilities, shudder, and continue with my tried and true Hunter. I was given a special version of a massive rocket launcher called the Iron Gjallarhorn, but it is a skin and I do not have the launcher to put it on, so I am sad. But I also got a new Iron Gjallarwing Sparrow which is like the Star Wars Speeder Bike and it has a cartoonishly loud air horn blast. This is the true prize, and even though most people in the game seem to have it as well I am delighted to finally have an elite fast Sparrow and the ability to scare birds with my horn whenever I feel so led. The light level which is the main way you upgrade your character’s power in the game was lifted and immediately we need to spend our in game currency and try to bridge the gap to the new baseline of 350. You can buy some items to get right to it, but sadly neither of us saved enough to do that quickly like we imagine most of the vets of the series have done. Another reminder that we are still relatively new to the series and we will have to grind to get to our goal. The game also helps you with better grinding rewards. Most of the blue or better items will be revealed to be slightly better than what you have so you are constantly swapping and absorbing your way up to 350. Also the rewards for much of the in game action is better, like events often grant a list of items instead of the paltry nonsense you may have gotten in the past. The endless quest for loot is re-engaged! We have only sampled a few of the missions but they have been decent with a different feel than much of what came before it. We hope to meet up with some people to check out a new raid but in honesty we probably need to grind again to be useful enough to help on such a quest. Ultimately, the expansion was good enough to draw us back in to the game (Sorry Madden) and we will post some more updates as we get deeper into the expansion. The Iron Gjallarhorn Rocket Launcher and iron gjallarwing Sparrow were our rewards for preordering the rise of Iron expansion. Chris Says: Destiny is more fun than ever, especially when receiving the bonuses that Dean described above. We are advancing in light levels quickly, I think I am a 334 as of this post. 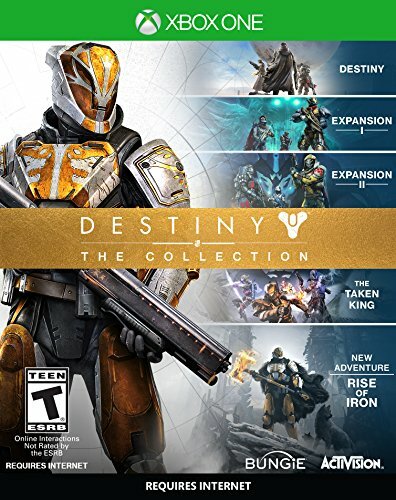 This has helped us greatly in acquiring weapons and other gear to take down Taken Zealots just the two of us, which seems to be a requirement in a lot of the side missions for the Taken King. We really have not delved into the main Rise of Iron story-line yet, but I am okay with this, as we still have plenty of missions to do from the previous expansions. These earns Legendary Marks, and sometimes a Legendary or Exotic Engram which can be traded in back at the Tower for an awesome item, which usually is way higher than what your current light level is. I am really looking forward to the Rise of Iron missions, because the variety of landscapes that I have seen in gameplay videos are a nice change of pace from the standard Mars terrain, or the junkyard of the Cosmodrome. We have noticed that end bosses in the missions we are playing are consistently getting harder. Last night, we played a mission called Fear's Embrace on the Phobos moon of Mars where the culminating boss battle was a circular room with a platform on the outer ring. In the middle awaited the Echo of Oryx who summoned masses of Taken Psions, Phalanx, and Minotaurs. In that center are where the boss lies, a poisonous gas fills the floor, hurting your character until you flee. But be careful, because on the outer ring are jet engines in the ceiling that randomly shoot flames at you. It's a bit of a dance, but it's definitely doable with two people at a decent light level. I will say this is the most that Dean and I have perished on a mission in a long time. It was a blast though, and the sense of accomplishment that it brought was something we had not seen in awhile. Hopefully the next couple are just as challenging, if not more. There also was a news piece this week that a very rare weapon can be found within the new Rise of Iron raids, where a puzzle must be solved prior to acquiring this rare piece of equipment. Sometime soon I hope to investigate into the Rise of Iron missions to seek out this mythical weapon. Stay tuned Guardians. Destiny 2 Is Announced, And We Are Excited! Destiny – Looking back after reaching level 36 (Less than 12 hours of Gameplay). Jun 3 Destiny – Looking back after reaching level 36 (Less than 12 hours of Gameplay).